Is a place of business still responsible for a slip and fall accident if they posted warning signs? The short answer is yes, a store could still be liable for your injuries even if a slip and fall warning sign was posted. Read on for a more detailed explanation. The second most common reason for personal injury cases is slip and fall accidents. 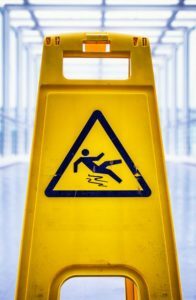 In fact, many of us may know someone who has been injured in a slip and fall accident- the precise reason for those brightly-colored warning signs posted on wet floors in public places. It is a common misconception that by posting one or more of these brightly-colored warning signs, a store is doing everything possible to prevent slips and falls on wet floors. However, if the warning signs are insufficient or placed improperly, the store could still be held responsible for your slip and fall accident. For instance, as customers are entering the store, they may not see a warning sign placed ten feet inside the store before slipping on the wet floor of the entrance. Similarly, if the sign is positioned so that only people inside the store can see it, it would not be an effective warning to patrons entering the store. To serve as an effective warning, the signs must be shrewdly placed so they can be seen by everyone and read easily at a glance. If the signs are not positioned appropriately, the store could still be held responsible. Because of all the different places where they can happen, liability for slip and fall accidents can sometimes be difficult to prove. Slip and fall accidents can happen, not just in stores, but on sidewalks, in parking lots, on playgrounds, even in your child’s school. Different scenarios will have distinct factors, and an experienced personal injury attorney can sort through the details and identify the responsible party. Further Reading: Does Driver Fatigue Really Make You More Likely to be in an Accident? If a store or place of business uses adequate warning signs properly placed, it is unlikely that an injured customer would be able to make a recovery. However, if the waning signs are too small or improperly placed, an injured customer could expect to make a recovery for their injuries. If you or someone you love has been injured in a slip and fall accident in Colorado Springs, it is important to understand your legal rights. Contact the experienced Colorado Springs slip and fall attorneys at the Green Law Firm today to schedule a no-obligation consultation and discuss your case. Call us today at 1-719-694-8515. By webadmin|2017-02-27T22:10:48+00:00February 27th, 2017|Blog, Colorado Springs Premises Liability Attorney, Slip and Fall Accidents|Comments Off on How Do Slip and Fall Warning Signs Affect Liability?